I started this Christmas stocking for myself years ago, and I still have to sew it together. 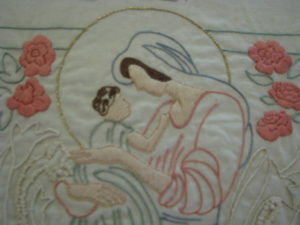 I really loved stitching this one of the Virgin Mary and Baby Jesus. It combined candlewicking, crewel work and some specialized embroidery stitches to create a gorgeous pattern. Maybe I’ll finish it this year! The top part of my yet-to-be-finished Christmas stocking!